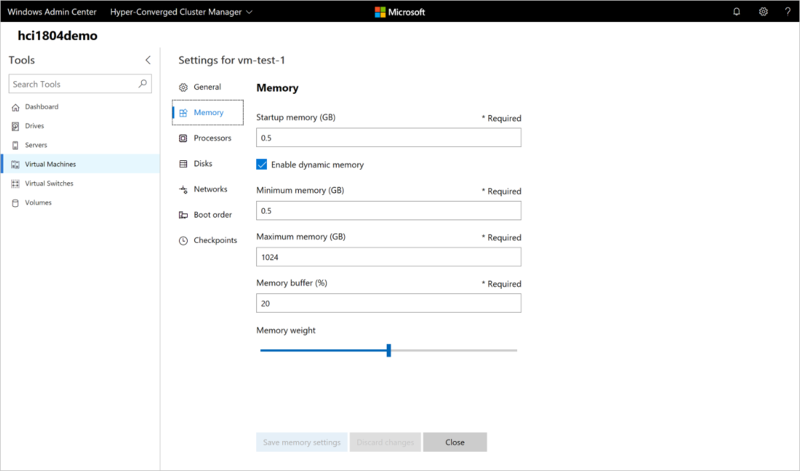 The Virtual Machines tool is available in Server, Failover Cluster or Hyper-Converged Cluster connections if the Hyper-V role is enabled on the server or cluster. You can use the Virtual Machines tool to manage Hyper-V hosts running Windows Server 2012 or later, either installed with Desktop Experience or as Server Core. Hyper-V Server 2012, 2016 and 2019 are also supported. High-level Hyper-V host resource monitoring. 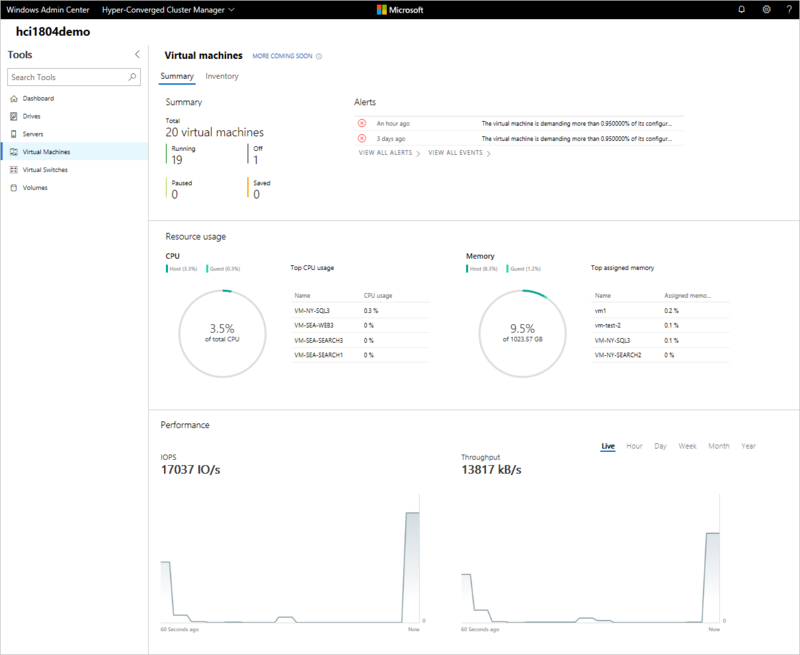 View overall CPU and memory usage, IO performance metrics, VM health alerts and events for the Hyper-V host server or entire cluster in a single dashboard. Unified experience bringing Hyper-V Manager and Failover Cluster Manager capabilities together. View all the virtual machines across a cluster and drill down into a single virtual machine for advanced management and troubleshooting. Simplified, yet powerful workflows for virtual machine management. New UI experiences tailored to IT administration scenarios to create, manage and replicate virtual machines. Click the Virtual Machines tool from the left side navigation pane. View a list of the virtual machines running on the current server or cluster. 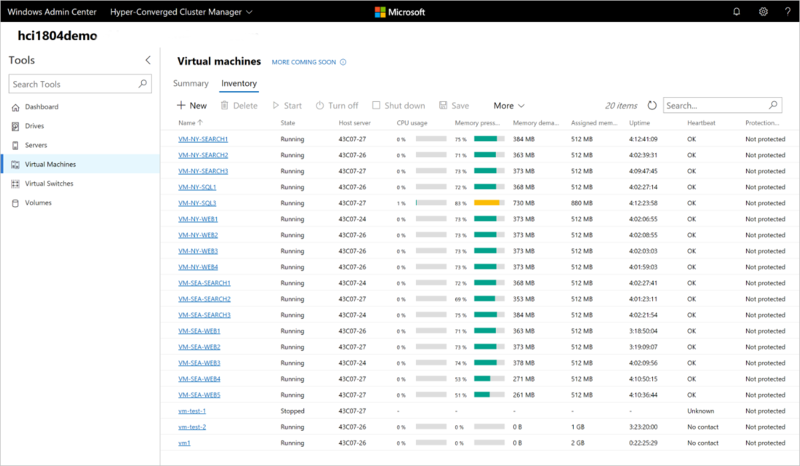 View the virtual machine's state and host server if you are viewing virtual machines for a cluster. 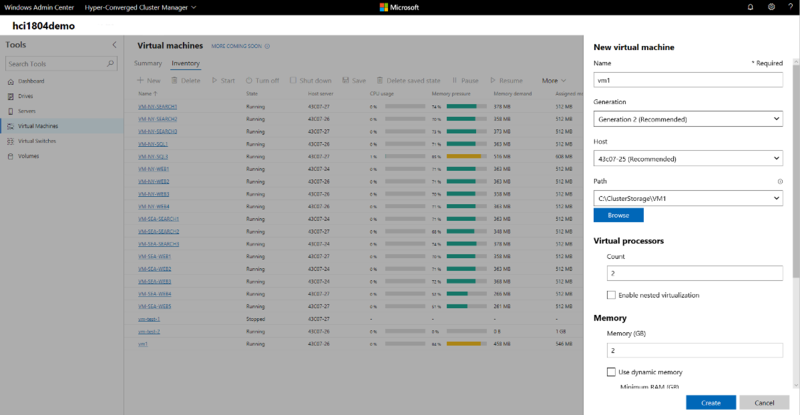 Also view CPU and memory usage from the host perspective, including memory pressure, memory demand and assigned memory, and the virtual machine's uptime, heartbeat status and protection status using Azure Site Recovery. Delete, start, turn off, shut down, pause, resume, reset or rename a virtual machine. Also save the virtual machine, delete a saved state, or create a checkpoint. Change settings for a virtual machine. Connect to a virtual machine console using VMConnect via the Hyper-V host. 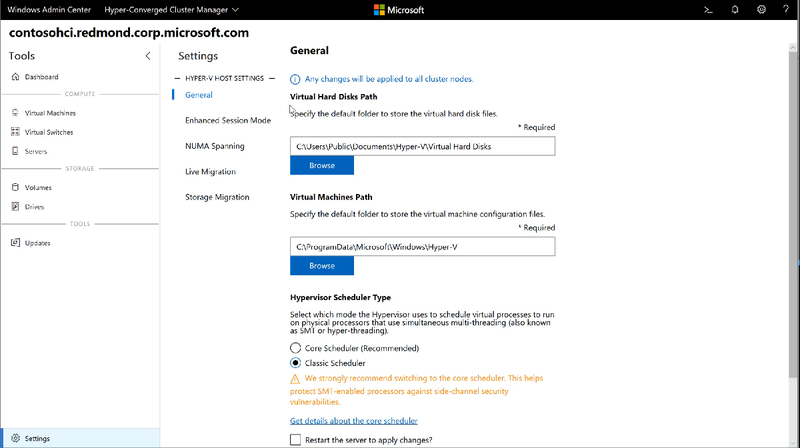 Replicate a virtual machine using Azure Site Recovery. For operations that can be run on multiple VMs, such as Start, Shut down, Save, Pause, Delete, Reset, you can select multiple VMs and run the operation at once. NOTE: If you are connected to a cluster, the Virtual Machine tool will only display clustered virtual machines. We plan to also show non-clustered virtual machines in the future. At the top of the Virtual Machines tool, choose the Inventory tab, then click New to create a new virtual machine. Enter the virtual machine name and choose between generation 1 and 2 virtual machines. If you are creating a virtual machine on a cluster, you can choose which host to initially create the virtual machine on. If you are running Windows Server 2016 or later, the tool will provide a host recommendation for you. Choose a path for the virtual machine files. Choose a volume from the dropdown list or click Browse to choose a folder using the folder picker. The virtual machine configuration files and virtual hard disk file will be saved in a single folder under the \Hyper-V\\[virtual machine name] path of the selected volume or path. In the folder picker, you can browse to any available SMB share on the network by entering the path in the Folder name field as \\server\share. Using a network share for VM storage will require CredSSP. Choose the number of virtual processors, whether you want nested virtualization enabled, configure memory settings, network adapters, virtual hard disks and choose whether you want to install an operating system from an .iso image file or from the network. Once the virtual machine is created and appears in the virtual machine list, you can start the virtual machine. Once the virtual machine is started, you can connect to the virtual machine's console via VMConnect to install the operating system. Select the virtual machine from the list, click More > Connect to download the .rdp file. Open the .rdp file in the Remote Desktop Connection app. Since this is connecting to the virtual machine's console, you will need to enter the Hyper-V host's admin credentials. At the top of the Virtual Machines tool, choose the Inventory tab. Choose a virtual machine from the list and click More > Settings. Switch between the General, Security, Memory, Processors, Disks, Networks, Boot order and Checkpoints tab, configure the necessary settings, then click Save to save the current tab's settings. The settings available will vary depending on the virtual machine's generation. Also, some settings cannot be changed for running virtual machines and you will need to stop the virtual machine first. If you are connected to a cluster, you can live migrate a virtual machine to another cluster node. From a Failover Cluster or Hyper-converged cluster connection, click the Virtual Machines tool from the left side navigation pane. At the top of the Virtual Machines tool, choose the Inventory tab. Choose a virtual machine from the list and click More > Move. Choose a server from the list of available cluster nodes and click Move. Notifications for the move progress will be displayed in the upper right corner of Windows Admin Center. If the move is successful, you will see the Host server name changed in the virtual machine list. You can view detailed information and performance charts for a single virtual machine from the single virtual machine page. At the top of the Virtual Machines tool, choose the Inventory tab. Click on the name of a virtual machine from the virtual machine list. View detailed information for the virtual machine. View, create, apply, rename and delete checkpoints. View details for the virtual machine's virtual hard disk (.vhd) files, network adapters and host server. Delete, start, turn off, shut down, pause, resume, reset or rename the virtual machine. Also save the virtual machine, delete a saved state, or create a checkpoint. Change settings for the virtual machine. 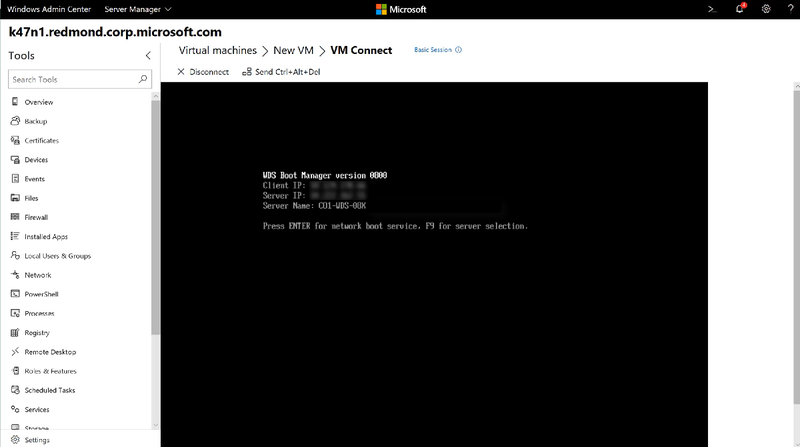 Connect to the virtual machine console using VMConnect via the Hyper-V host. 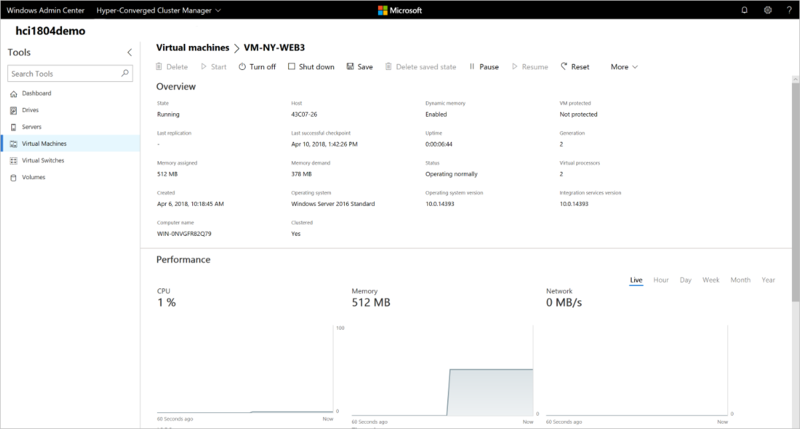 Replicate the virtual machine using Azure Site Recovery. At the top of the Virtual Machines tool, choose the Inventory tab. Choose a virtual machine from the list and click More > Connect or Download RDP file. Connect will allow you to interact with the guest VM through the Remote Desktop web console, integrated in to Windows Admin Center. Download RDP file will download an .rdp file that you can open with the Remote Desktop Connection application (mstsc.exe). Both options will use VMConnect to connect to the guest VM through the Hyper-V host and will require you to enter administrator credentials for the Hyper-V host server. On a Server, Hyper-converged Cluster or Failover Cluster connection, click the Settings menu at the bottom of the left side navigation pane. If you make any Hyper-V host setting changes in a Hyper-converged Cluster or Failover Cluster connection, the change will be applied to all cluster nodes. You can view Hyper-V event logs directly from the Virtual Machines tool. At the top of the Virtual Machines tool, choose the Summary tab. In the top right Events section, click VIEW ALL EVENTS. The Event Viewer tool will show the Hyper-V event channels in the left pane. Choose a channel to view the events in the right pane. If you are managing a failover cluster or hyper-converged cluster, the event logs will display events for all cluster nodes, displaying the host server in the Machine column.